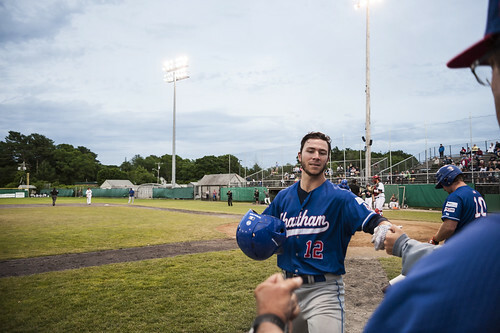 After snapping their three-game losing streak on Friday against the Yarmouth-Dennis Red Sox, the Chatham Anglers (7-6-2) will be back at Veterans Field on Saturday night to face the Harwich Mariners (9-7-1) for the first time this summer. Chatham got back to its winning ways on Friday, defeating Y-D (8-6-2), 5-2. The victory marked Chatham’s first win after an off day this summer after losing its previous three. The A’s used a mixture of power and small ball in the win. Tristin English (Georgia Tech) and Drew Mendoza (Florida State) each powered solo-home runs in the bottom of the fourth inning to put Chatham up 2-0. Colin Simpson (Oklahoma State) added to the lead an inning later, hitting a two-out RBI single, scoring English. Each of Tristin English's three home runs this season have come in his last three games. English, Adam Fogel (Hawaii) and Ben Ramirez (Southern California) each registered two hits on the night. The middle of the lineup, which A’s manager Tom Holliday has called on to step up in recent days, accounted for the majority of Chatham’s offense. Alongside Fogel and Ramirez, Branden Fryman (Samford), Jake Taylor (Oklahoma State) and Mendoza all reached base. Despite coming into Saturday as one of the worst offensive teams in the league, Harwich is currently riding its best scoring stretch of the season. The Mariners have scored 10 runs in two of their last three games after failing to reach double-digits in their first 14 games. In 11 games this summer, they have scored three runs or fewer. Harwich is third-to-last in the Cape League in runs (60) and home runs (four). Despite their low production, five Harwich players have tallied at least 13 hits on the summer, compared the Chatham’s three. The Mariners’ pitching staff has propelled its winning record. The staff has the lowest ERA (2.72) while allowing the fewest runs (52) in the CCBL. Six different Harwich pitchers have tossed four or more innings while surrendering zero runs. Dan Hammer (Pittsburgh) will make his first start of the season on Saturday. Hammer has two relief appearances under his belt, tossing a combined 8.2 scoreless innings. The Philadelphia native — along with Davis Daniel (Auburn) — is one of two A’s pitchers to make at least two appearances while allowing no runs. Hammer’s two outings came in opposite game scenarios. On June 16, he threw the final five frames in a 10-1 blowout against Hyannis, a performance Holliday called “special”, as it can be difficult to stay focused with such a large lead. Six days later, Hammer tallied 3.2 innings of work, shutting out Bourne as the Anglers came back from six runs down to win, 8-6.